As an online retailer we view packaging as a key part of what we do. It's one of the few physical touch points we have with our customers. We've experimented a lot along the way and have finally settled on what our customers tell us is a fantastic experience to open. Most importantly, the shoes themselves! This packaging fits with our brand proposition. We offer high quality, beautiful bespoke, customised shoes. With that comes bespoke, tailored customer service. And your shoes are delivered in high quality, beautiful packaging complete with a customised photo and letter. This sort of packaging isn't going to work for all brands. It costs us a couple of dollars more than standard packaging so if the brand proposition for your online retail business is the lowest price this type of packaging might not work well for you. However it fits nicely with our brand and when viewed as a marketing investment rather than an operational expense, we get a great return on investment from the money we spend on our packaging. It's another 'purple cow' reason for customers to talk about our brand as Lucie has. In addition to the time and effort she's gone to to put this photo together, I love her comment, "You got me pretty emotional Shoes of Prey! Thank you so so much! ♥"
How do you approach packaging in your business? 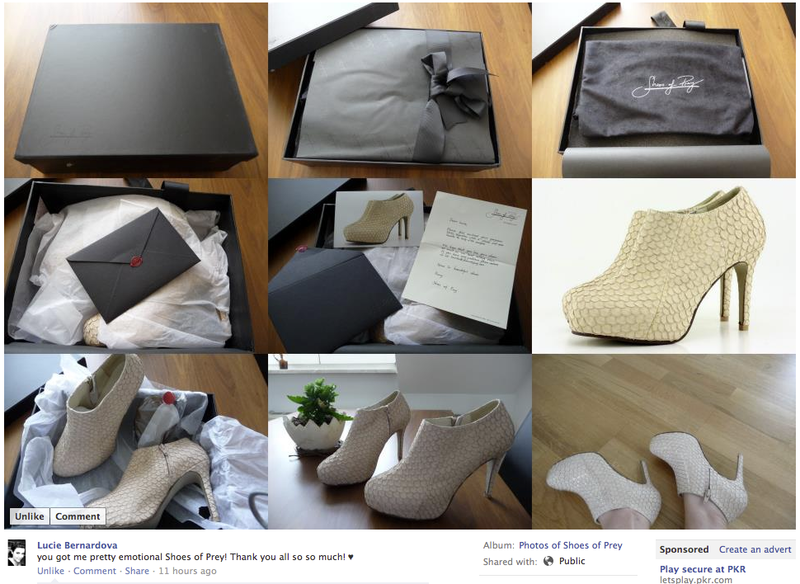 Which online retailers have you seen who do packaging really well? Posted to Power Retail. That's very cool I have to say. You have a way of creating customer engagement. Is packaging differentiation something you plan to do with sneakingduck as well or would you say that doesn't fit well with glasses? Hi Jonathan, good question. We've got some really nice packaging for Sneaking Duck but at this stage we're not going quite as overboard as we do for Shoes of Prey. We're pitching Sneaking Duck as a fast fashion, more mass market brand whereas Shoes of Prey is pitched as an upper mid level fashion brand, so the difference in our packaging ties in with that branding. What you do with your packaging needs to tie in with your brand. I find it fascinating the JB HiFi strip out the expensive tiling on the floor of their Westfield stores when they move in to install polished concrete flooring because they want their whole store to tell the story that they're a discount retailer. If you're an online retailer and your point of difference is price, your packaging should arguably match this and be designed to keep costs down, so what we do with our Shoes of Prey packaging isn't necessarily for everyone. I think this packaging is fabulous! It certainly adds to the excitement of receiving new shoes and adds such a personal touch. Great work Shoes of Prey. That packaging is awesome, the fact that you didn't post them on your blog until someone uploaded them up on facebook is quiet something too. Am wondering how the package got to the customer in such great shape, is there an outer packaging to the main matte black box? Also, I'm aware that most shipping companies from where the shoes are produced are charged in volume weight and not real weight, are you guys paying the premium of carrying air with these shoes? We use a cardboard outer carton to protect the matte black box. DHL have a bag that we use, if a product fits inside the bad they only charge actual rather than volume weight. We've designed our outer cartons so they just fit inside the DHL bag. Welcome to the team Lucy Beynon! Telstra Business Women's Awards - Jodie Fox!